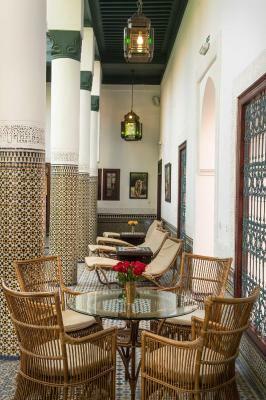 Lock in a great price for Palais Riad Lamrani - rated 9.5 by recent guests. Beautiful Garden, Great Ambience, Lovely private Roof Terrace, Our room (Pasha) had a pretty balcony over the beautiful pool. Staff were very helpful and informative. We only ate one evening meal in the resto but the service and food were very good. Bang in the centre of the old city, just a few minutes away from Jema al Fna, this is a lovely riad with the most hospitable staff. 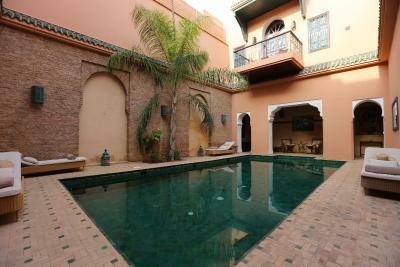 Would recommend this riad to anyone travelling to Marrakech. Fantastic tranquil stunning property. 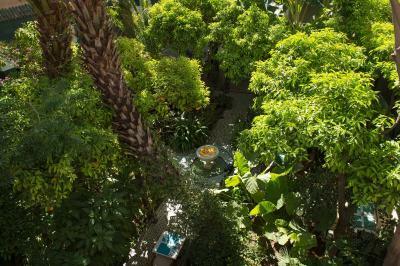 Open areas, and quiet, secluded spots and relaxed atmosphere. Pretty gardens and lovely touches in decor. 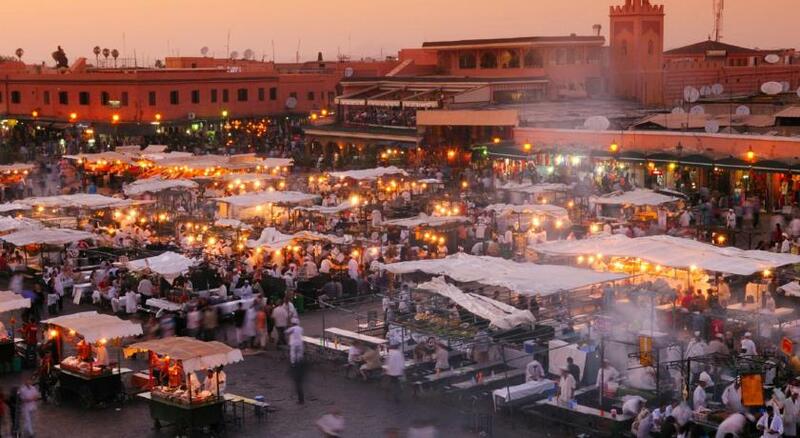 Lamrani is a little paradise in the heart of the Medina. The hostess, Laurent, gave us a fantastic tour on arrival, detailing the intricate history of the Riad. 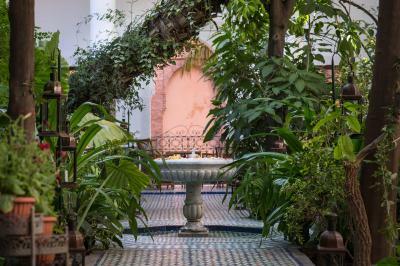 The Riad itself has a beautifully cared-for garden at its heart, where dinner and breakfast are served among the tiled pillars; and a rooftop area resplendent in pink with glorious views. It was truly a gorgeous stay. The room is very spacious and clean as well as nicely decorated and furnitured. The staff was nice and polite. Everything was perfect. The location was very good, easy access to taxi but in the middle of Medina, near several points of interest and top restaurants. The place itself is beautiful, with an amazing inner garden, large and comfortable bedrooms, with an extra care for its decoration. Very good breakfast, not much variety, but everything very well cooked. We did an Hammam there that was a very pleasant surprise. The staff is very thoughtful, always willing to help us with any request. Would highly recommended it and hope to be back. Beautiful location, the staff were extremely professional and polite. We even had the chance to meet with the owners and felt very well received. Highly recommend. 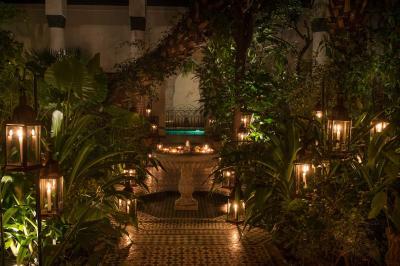 Offering an outdoor pool and a restaurant, Palais Riad Lamrani is located in Marrakech. Free WiFi access is available. Each room here will provide you with a TV, air conditioning and a minibar. Featuring a bath, private bathroom also comes with a hairdryer and bathrobes. 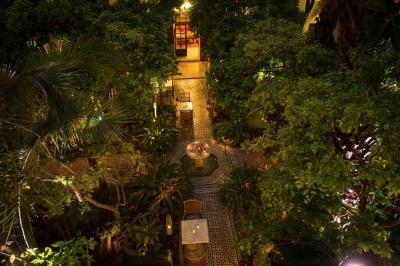 At Palais Riad Lamrani you will find hammam, a garden and a terrace. Other facilities offered at the property include a shared lounge and luggage storage. 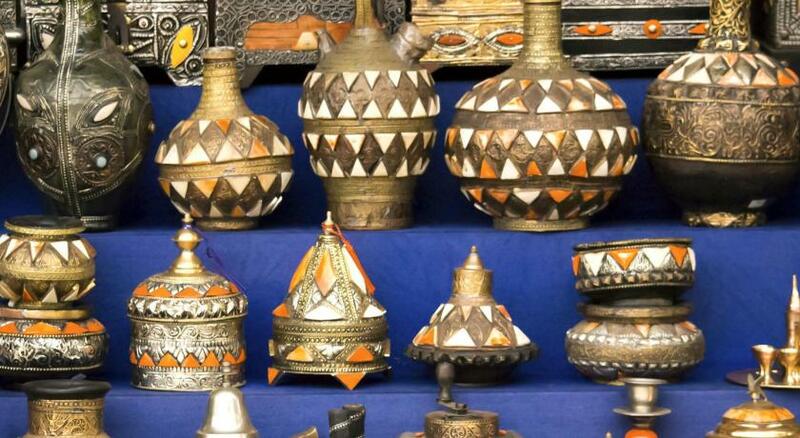 The riad is 350 yards from Souk of the Medina and 450 yards from Djemaa El Fna. Marrakech-Menara Airport is 2.5 miles away. Palais Riad Lamrani has been welcoming Booking.com guests since 29 Aug 2014. When would you like to stay at Palais Riad Lamrani? This twin/double room has a patio, air conditioning and minibar. House rules Palais Riad Lamrani takes special requests - add in the next step! Palais Riad Lamrani accepts these cards and reserves the right to temporarily hold an amount prior to arrival. Please inform Palais Riad Lamrani in advance of your expected arrival time. You can use the Special Requests box when booking, or contact the property directly with the contact details provided in your confirmation. Truly beautiful Riad in the center of the medina. Walking distance to all you want to see and visit. Extremely friendly and helpful staff that helped us with all we needed. We got loads of recommendations for restaurants, museums and places to visit. Very personal service during our whole stay. They need to change their low energy room lights for LEDs...the rooms are quite dark which I get, but it’s nice to have choice of light or not. Don’t book trips through the hotel as the price is massively more than going direct or through trip advisor. Great service, location and comfort. 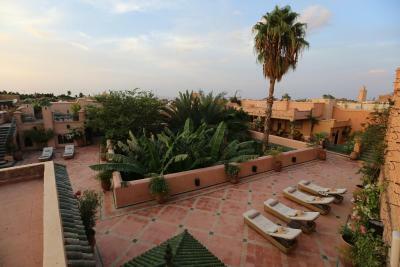 Very nice and spacy riad with only six rooms in total, which makes for a very quiet and relaxed atmosphere. Would recommend it 10/10. Great location in Medina. Staff and management were extraordinary - helpful with advice, setting up a guide, even taking us to train station at the end of our stay. Meals were good in a garden setting. Although not necessarily a drawback for all, the internet only works in a few tiny spots of the Riad. The breakfast is good but not at the standard of the rest of the Riad. In comparison, dinner was excellent and the chocolate fondant dessert to die for! !